Weeelllll, that was the longest 28-day month ever! I made 28 PDFs to accompany 28 posts that featured 28 flagship beers after getting in touch with 28 breweries and putting my lips on 28 beers. 14 beers were consumed at the brewery and 14 were consumed at home. Every brewery had personal input, but I had 12 in-person conversations and 2 phone conversations to aid in building the profiles. It was more than 28 beers, as you might imagine, because some got left by the wayside, but the work was put in and I wouldn't trade a day or a beer for any of it. I can't tell you how long it's been since I've been so proud to be part of a group undertaking such as this in the beer industry. And hopefully you didn't miss the real reason this all got started -- FlagshipFebruary.com. While I featured Stoudts Gold here on Feb. 21, that was also the date where my full story about the Stoudt family and the Stoudts Gold Lager was featured amongst 27 other beer writers from around the world. Our project was to bring attention to the "beers that got us here". There was representation from Europe, South America, and North America. It was an incredible honor to be listed amongst them. Go read up on the tag-team finale posting from Stephen Beaumont and Jay Brooks, the two primary guys behind the organizational undertaking that it was to corral 28 writers for 28 consecutive days. Then let's meet up for a beer and we can talk more about the past, the present, and the future of great beer. I'm closing out the month of #FlagshipFebruary with two American classics that help start us down the road to where we are today. Throughout the month, I first featured 26 flagship beers in the greater Philadelphia region. Then, yesterday, I featured Anchor Steam and today I bring this undertaking to a close with Sierra Nevada Pale Ale. Similar to my mention in Anchor's feature, Sierra Nevada's place in American brewing history is well documented and cemented. A book could be written (actually, owner Ken Grossman did write a book) about everything from the simple beginnings to the complex organization that the brewery has become. After many, many dozens of trips to northern California, I finally made my first visit to the brewery's HQ in Chico in late 2017. I'd been to their satellite location in Berkeley - The Torpedo Room - already a few times. In Chico, I got the VIP treatment with food and beer and a two-hour tour and sampling. Even sampled Celebration from the zwickel. Now I need to add Mills River, NC to my travel list to see the brewery's east coast operation, which I'm told takes the patchwork Chico brewery and perfects it into something even more grand - the Disneyland of Beer, if you will. 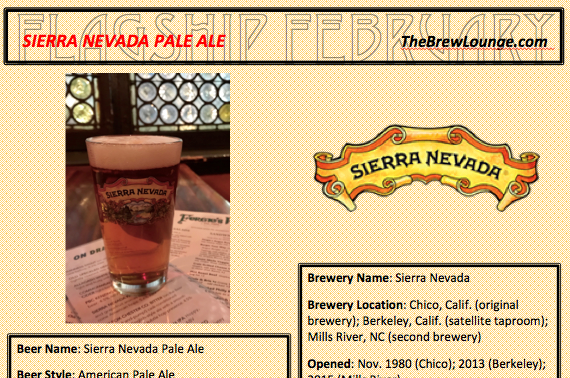 Now click the picture below for a full feature on Sierra Nevada Pale Ale. Disclosure: For this project, I solely created the list of 28 beers featured here on The Brew Lounge. I was in contact with each brewery and neither required nor requested complimentary samples. I purchased today's Sierra Nevada beer at Fergie's Pub, which participated with Flagship features throughout the month on beers like Sierra Nevada's Pale Ale. Anchor Brewing's special place in American brewing history is well-documented. If you're not familiar, I strongly suggest checking it out over here. In my frequent trips to the Bay Area over the last twenty years, I've drank plenty of Anchor around town, at the SFO airport, and been to the landmark brewery twice. Somehow, in all my grand organization of pictures on my numerous hard drives, I'm not able to dig up the interior brewery tour pictures I have from the past. Just the more recent exterior ones I've included in my PDF below. Around ten years ago, an unfortunate cross-country flight delayed by more than three hours, had me missing my invitation to the brewery's annual holiday party. But after this feature, I'm pledging to take them up on their offer for a re-visit (finally!) during my next trip to the city. The new era of Anchor sees longtime familiar faces like Maytag, Mark Carpenter (brewmaster since 1971), and others retired/moved on. The newest owners, Japan-based Sapporo, acquired Anchor in 2017, but the beer persists. I miss the Brekle's Brown, Bock, and interesting beers from the Zymaster Series, But, in addition to Steam, I still find myself eagerly seeking out the Liberty Ale, Old Foghorn, Porter, and the annual changing recipe that is the iconic Christmas Ale. 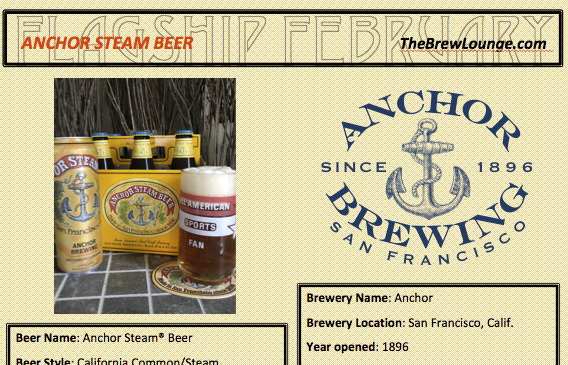 Now click the picture below for a full feature on Anchor Steam. Disclosure: For this project, I solely created the list of 28 beers featured here on The Brew Lounge. I was in contact with each brewery and neither required nor requested complimentary samples. I purchased today's Anchor beer at retail, but was also provided with the "stovepipe" can sent from the brewery as part of a media mailing. I'm fairly certain that each time I've eaten at Sterling Pig, there's been a burger in front of me...or pulled pork. Burger and a beer. 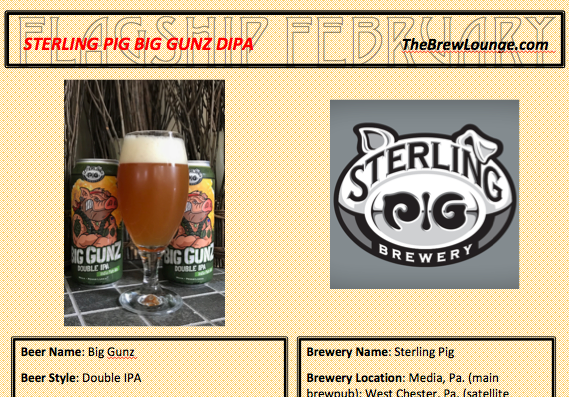 Either the Snuffler IPA or the Big Gunz DIPA or the This Little Piggy IPA. It just makes perfect sense. There are also nachos, the Czerw sausages, smoked wings, and wood-fired pizza. The kitchen makes great use of the wood-fired oven. And you're tempted with the aromas from the minute you park the car. From the brewery, the Shoat Pilsner is very well done as is the Porc Noir Black IPA. You know how happy I am that someone is still making a solid Black IPA? And, they've now officially opened their satellite location in West Chester -- another showcase for Brian McConnell's beer. It goes on the growing list of new places I need to check in on. Now click the picture below for a full feature on Sterling Pig Big Gunz. Disclosure: For this project, I solely created the list of 28 beers featured here on The Brew Lounge. I was in contact with each brewery and neither required nor requested complimentary samples. I purchased today's Sterling Pig beer at retail. The home of Philadelphia Brewing Company in Kensington is a strikingly beautiful look back on the city's brewing history. Once home to Weisbrod & Hess (1882-1938), markings of the brewery are still evident in the stone and tile work as well as the original name emblazoned on the exterior facing Amber Street. A lot of good beer and events served up in one block where Philadelphia Brewing anchors one end, while popular Martha bar occupies the other. The annual Open House/Holiday Party, typically at the end of November, draws a crowd for live music, food, and beer while also serving as a cat rescue fundraiser. From the brewhouse, the solid staples keep fans happy, but some of the interesting seasonals are eagerly anticipated just the same. Fleur de Lehigh - with ginger, lemongrass making it a perfect springtime beer, Shackamaximum - its big rich malt flavors making it a perfect wintertime beer, and the Harvest From The Hood - as local as local hops get from their front yard making it a perfect fall beer, are three that I reach for throughout the seasons. Electro Lyte is a low-alcohol, big flavor beer inspired by the running community. I miss the Rowhouse Red, but admittedly that's a style with generally a tough sell these days. 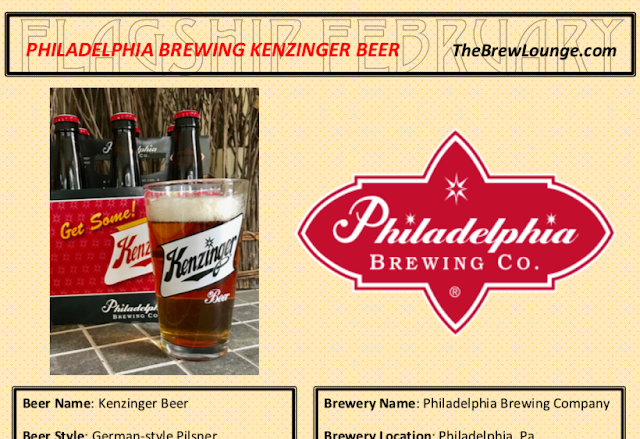 Now click the picture below for a full feature on Philadelphia Brewing Kenzinger Beer. Disclosure: For this project, I solely created the list of 28 beers featured here on The Brew Lounge. I was in contact with each brewery and neither required nor requested complimentary samples. I purchased today's Philadelphia Brewing beer at retail. 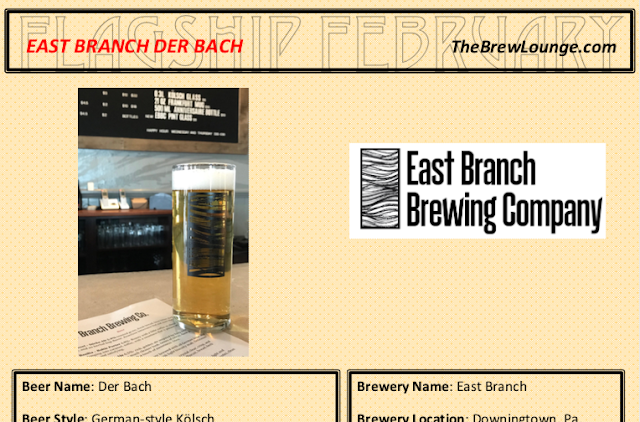 East Branch has been a perfect addition to Downingtown's beer scene. As Victory has grown much larger, East Branch opened almost two-and-a-half years ago (coincidentally, with former Victory brewer, Kevin McGovern, manning the mash paddle) to fill the demand for a small brewpub. The brewery opened first with a small tasting bar and later moved the bar to a much more spacious upstairs, complete with a kitchen turning out some impressively creative dishes to complement the beer menu. (The downstairs restaurant, Estrella, serves East Branch beers as well in addition to other regional beers and a full bar.) From East Branch's menu, provided your dietary requirements do not begin with a "V", you absolutely must try the Brisket Noodles. Preferably, if you go now, with a Düssel Sticke Alt. Would love to see breweries (and consumers!) getting back on board with this style in the way that Root Down has (recall I mentioned earlier this month?) and East Branch does from time to time as well. Now click the picture below for a full feature on East Branch Der Bach. Disclosure: For this project, I solely created the list of 28 beers featured here on The Brew Lounge. I was in contact with each brewery and neither required nor requested complimentary samples. I purchased today's East Branch beer while at the brewpub. Once you find Sly Fox's production brewery and taproom off the highway, down the railroad tracks, across the creek, and on the backside of a business park at the end of the local municipal airport in Pottstown, you'll find it difficult to leave. Quite a few good things about their hidden location. One is that after hours during the week and all weekend long, they have the business park pretty much to themselves (and neighboring Manatawny Still Works across the street). Things have gone well for the nearly 25 year old Sly Fox and its befitting that they reside on Circle of Progress Drive in the business park. Another fortuitous piece of the puzzle is the adjacent grassy piece of land that hosts their oversized outdoor annual events -- Bock Festival/Goat Races; Taps, Tunes, & Trucks; Cyclocross; and Can Jam Festival. Inside, there's excellent pizza and sandwiches to pair up with a brewery tour, a few beers from a wide-ranging lineup, and a relaxing visit. On a nice day, sitting outside and watching planes take off and land at the airport adds to the atmosphere. They always have a lot going on, a decent amount of it Irish- and German-inspired (like this featured Pils), and growth on the horizon with planned satellite operations on the drawing board for nearby Malvern, Wyomissing (in Berks County), and across state in Pittsburgh. 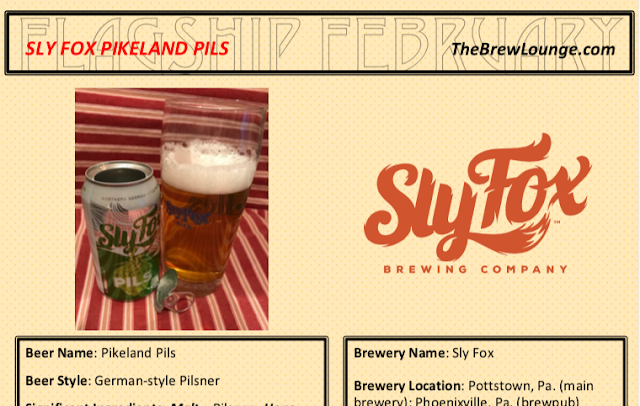 Now click the picture below for a full feature on Sly Fox Pikeland Pils. Disclosure: For this project, I solely created the list of 28 beers featured here on The Brew Lounge. I was in contact with each brewery and neither required nor requested complimentary samples. I purchased today's Sly Fox beer at retail.